The ABG President, CHIEF DR. JOHN MOMIS has called on the people of Bougainville to unite despite their differences as Bougainville has one noble ambition to fulfil that is to vote on the future status of Bougainville at the coming referendum. In his New Year message to the people of Bougainville, PRESIDENT MOMIS said that Bougainville has progressed despite the National Government’s failure to fulfil the Bougainville Peace Agreement. He said that the Bougainville Peace Agreement is a joint creation of the PNG Government and the ABG and therefore the two governments must work together and implement the Peace Agreement. 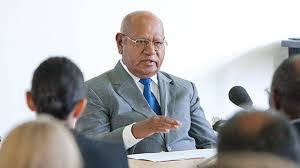 PRESIDENT MOMIS said despite this Bougainville has continued to move forward with policies and laws that will enable the ABG to operate in the future. With the Bougainville Mining law and the approval of Exploration licenses for three local joint venture companies the government has started getting some monies to support the government. President MOMIS praised Prime Minister PETER O’NEIL and his members and the ABG delegation for agreeing to speed up development issues in 2018. He said that the National Government has agreed to complete the Buka Ring road sealing, KOKOPAU to Arawa road upgrading and sealing, the Arawa to Buin road sealing in 2018. President Momis also announced that the National Government will finally fund the SIARA TO KORIPOVI road that has been neglected for a long time. He said that the West Coast of Bougainville is one economical road that the government has not looked into in a long time.